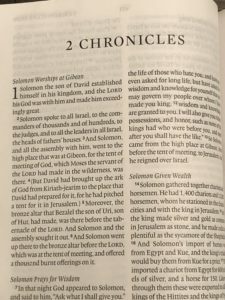 One of the top 4 English Bible Translations that I use is the English Standard Version. 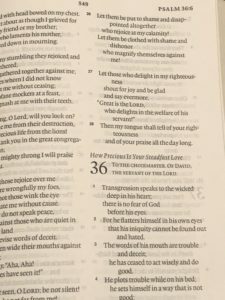 It is no secret that I love Crossway’s Bibles and when the chance to review a large print ESV Bible came up, I had to jump on it. 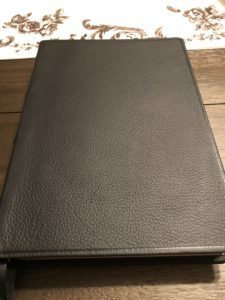 Crossway sent me the top grain leather edition free of charge in exchange for an honest review; my opinions are my own. 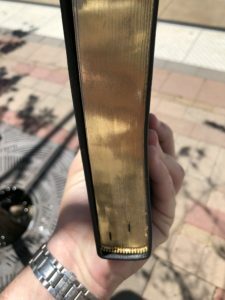 Also, some of the pictures were taken outdoors to capture this exquisite Bible in natural light. 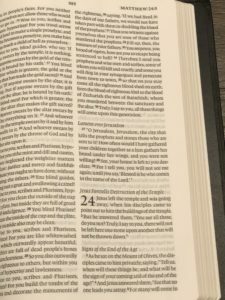 ESV is an essentially literal translation, meaning it falls on the word-for-word or form based end of the translation spectrum. It is as accurate as NASB but not as rigid, I have found that is sounds very liturgical and the rhythm and cadence lends to reading aloud. It is ideal for congregational reading as well as personal study. Based on the feel and smell, this top grain leather is almost certainly a calfskin. The grain is somewhat pronounced but I lack an adjective to describe the softness of the cover and the delight it brings to the touch. I own a couple goatskin, full grain leather Bibles that are not this delightful to have in my hands. 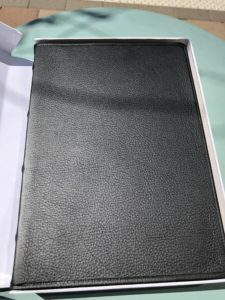 I swear that Crossway does something to the leather to make you want to open your Bible over and over again. The best way I can describe the leather is to say that it is limp and supple and an absolute delight to touch. 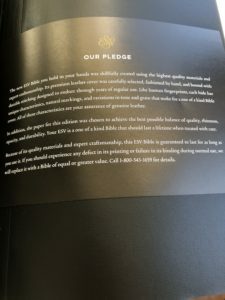 Crossway is well known for their sewn Bibles, so well known, in fact, that they come with a lifetime guarantee. This particular Bible has what I describe as medium tightness. 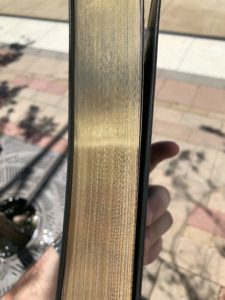 Some Bibles like R. L. Allan’s are very loose and tend to feel like they might fall apart at any second while other Bibles like Cambridge Bibles are very tight and even though they lay flat are not as loose in the hand. 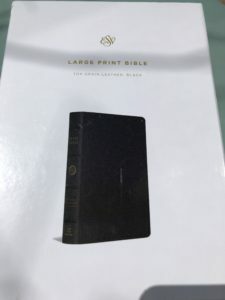 The ESV Large Print Bible is the perfect blend, loose enough to be comfortable for one handed use yet tight enough to not leave you wondering if it will fall apart. The font is spectacular, 11.5-point; it is a true large print, unlike many who deem a 9-point font to be a large print. This size incredibly easy to read. 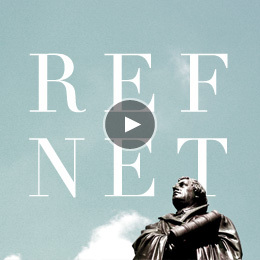 Crossway uses fonts in the Lexicon Family which are somewhat bold, with deep rich blacks. 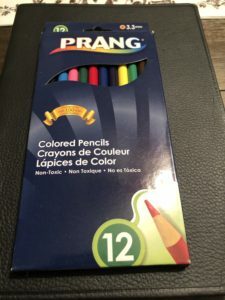 This is not a red letter edition and you may have mixed feelings about that but I do not find them useful on my podium when I am trying to teach. 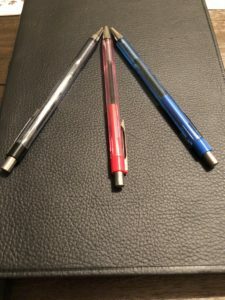 36 GSM Thinopaque paper is what Crossway uses for paper. This is an ideal choice with the double column paragraph format that we are treated to here. 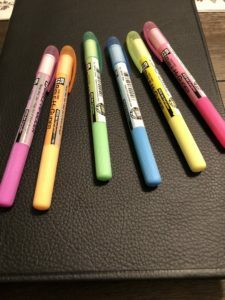 The paper is thin enough to keep the Bible from being cumbersome yet still thick enough that you can mark in the Bible without bleed through and while we are on that subject, this is a line matched Bible and there is no show through of the text. During my review period, the ESV Large Print Bible came with me into my secular employment arena alongside my NLT. For one on one ministry it cannot be beat. The overall size fits on almost any desk easily. On the lectern, it was everything I wanted- large font, easy to read, portable; I could not ask for more. 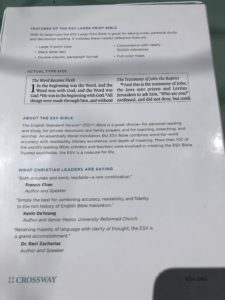 It is hard for Crossway to outdo itself and I doubt that any other publisher could out perform Crossway. The quality offered by Crossway is unmatched anywhere. I highly recommend their Bibles to anyone.